Smoothies. Everyone seems to have a favorite recipe and I certainly have mine. I drink a smoothie practically everyday. It’s my breakfast on-the-go. I have two favorites that I alternate depending on my craving. I simply blend, pour in a glass, pop in a straw and drink on my way to work. Super easy, refreshing and most importantly filling! Yes, that’s my cat in the picture wondering why I have all these ingredients on the floor ;) Speaking of ingredients, let’s get to it. First shake is my banana berry smoothie, a good one for beginners who may not be down with the whole ‘shake for breakfast’ idea. – Three to four slices frozen banana (I pre-freeze bananas once the skin starts to turn a bit. Just slice them into chunks and throw in a freezer bag). 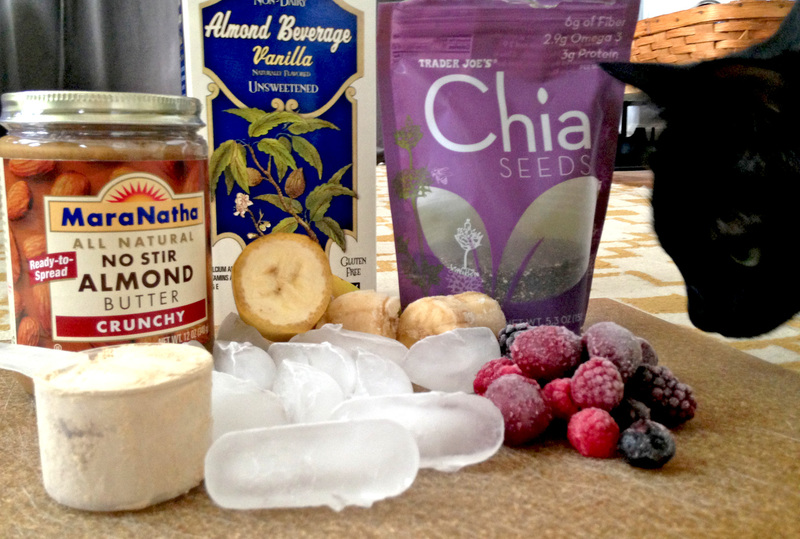 Frozen bananas add a distinct creaminess to shakes which is why I love using them! Once you have all your ingredients ready simply add to your blender. I tend to add just enough milk to reach about a 1/2″ to 1″ below all my ingredients. Once I start blending, if I feel it needs a little more liquid, I’ll slowly add some at this point. If you are in the market for a new blender, we have one by Oster and it’s amazing. We use it EVERYDAY and it hasn’t failed us once. I tend to like pretty creamy shakes so I really watch the proportion of ingredients to milk to create the perfect balance. Play around with it until it’s to your liking. Pretty easy right? Drinking a shake for breakfast may take some getting used. I find they keep me fuller much longer than cereal, toast, oatmeal and other breakfast items I used to eat in the past. Plus, I have a little extra time in the morning as I know I can drink it down in my car on the way to work. My other favorite smoothie is a green smoothie. Everyone seems to have a green smoothie recipe in their arsenal these days. Mine is super simple and delicious. 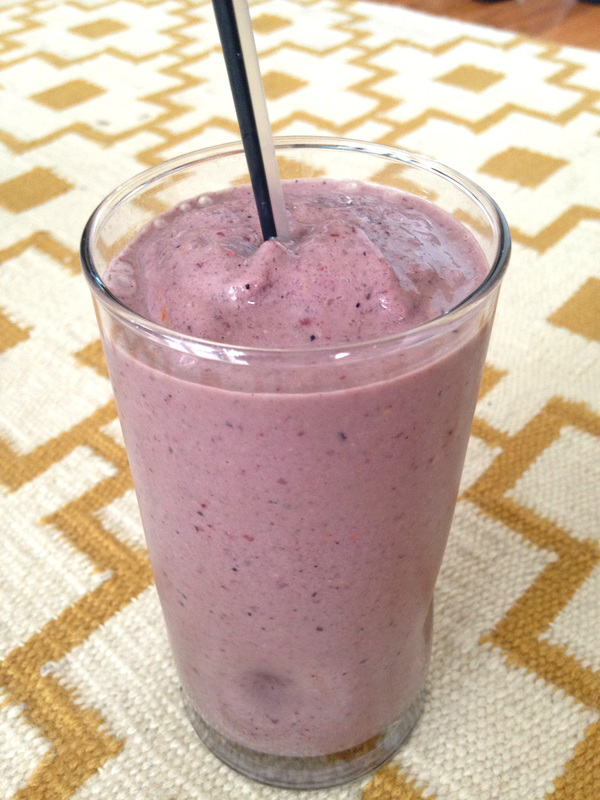 It’s very similar to my berry banana shake so once you get the hang of that, this recipe is a breeze. 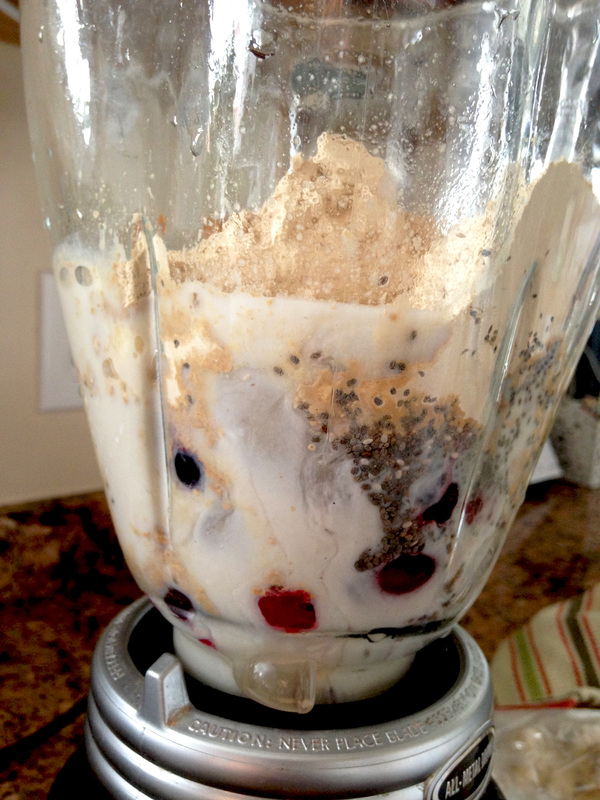 Throw everything into a blender and blend away! If you require more milk to get things going, feel free to add. If I want an extra added jolt of sweetness, I’ll add a raw date (no pit) to the mixture when blending. When I wake up starving and feel like a shake won’t cut it, I’ll add a couple heaping tablespoons of gluten free oats to the mixture. If you have a good blender or Vitamix you won’t even taste the spinach or notice the ground up oats. Pure green deliciousness! Try one this week and see how you like it. Play around with ingredients and proportions. You can add different types of fruits, nut butters and protein powders, whatever floats your boat. Enjoy!